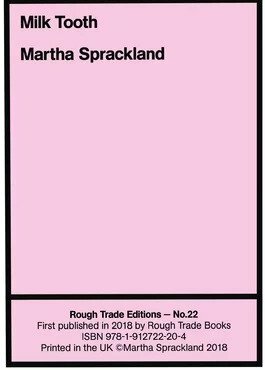 The title of Martha Sprackland’s new pamphlet, Milk Tooth (Rough Trade), might denote a wish or an ache, something missing, a talisman wrought from the body, a souvenir of pain. A reminder that we are all animals of a sort, struggling for one or more kinds of survival. Milk Tooth opens with an epigraph from Judith Jarvis Thomson’s A Defence of Abortion, which offers a philosophical defence of abortion on the grounds that a foetus’s right to life does not trump the woman’s right to control her own body. The quote comes from a section in the essay where Thomson undermines by analogy arguments that suggest abortion is unjust killing, showing how most defences set up against insemination are subject to failure or fault, and complicating the idea that every woman is ‘responsible’ for her pregnancy. She asks us to consider the body in parallel with the house, to imagine a life in which one protects oneself by establishing a pristine environment, by maintaining firm boundaries between inside and outside. Reading Milk Tooth, I envision this house as a red-walled, pulsating thing: at once beautiful and decaying, permeable and crowded with wonder and horror. Picturing a ‘milk tooth’, I see a small hard seed: evidence of growth, nourishment, possible futurity, taking root. I think of the ‘people-seeds’ in Thomson’s essay, which float through unsealed windows and threaten to sprout in carpets, confusing obligations of hospitality and responsibility. Throughout her sequence of poems, Sprackland examines the embodied complications of pregnancy and loss, through contexts both personal and medical, richly affective and curiously estranged. Opening with a more direct account of medical experience (‘A room in London’) and closing with a fragmentary narrative poem named after De la lycanthropie, transformation et extase des sorciers, a seventeenth-century tract on lycanthropy, Sprackland dramatises specific instances of painful experience as part of a lineage of discourse around bodily transformation and nonhuman encounter, bearing tales of sacrifice, death, growth and transference: ‘a maggoty apple / is a fact of life’. What carries through is the sense of an undersong seething, approaching the bloom of myth as a way towards, if not healing, then, at least the vivid ‘anaesthesia’ of the imaginary. Sprackland populates her poems with material images pulled from fairy tales and myth: shiny things, rotten things, ‘maggots’ and ‘gasoline’ (‘Gasoline’). The ‘I’ is frequently excised in favour of a more oblique telling, where grief, strain and exhaustion are expressed from often depersonalised or collective perspectives, in narrative vignettes and visceral, surprising images: ‘There is a state in which / the tumorous body has wonderful skin’. This story is not just the speaker’s story: in her specificity of detail, Sprackland makes cuts of events to connect the shared and subjective. The influence of Sharon Olds, whose intense poetic autopsies of personal life provide grounds for extrapolation, is clear, but Sprackland is perhaps more abstract. The stories within Milk Tooth are sifted through and shifting; we witness in the poems this emotive, metaphoric processing as a hesitant search for ways of ‘knowing’ the body’s traumas. While riffing on tropes and motifs from familiar territory, Sprackland avoids sensationalism or cliché by drawing out subtleties in the images she uses. In ‘Speculum’, the addressed ‘you’ is ‘recognise[d]’ as a bird-like creature, at first ‘jabbing / at the lawn’ and then by the end is a ‘Dead blue bird, [lying] at hand / empty as a plague-mask’. Speculum is a word that fuses medicine and ornithology. It means a metal instrument used to dilate an orifice or bodily canal for inspection, but also a bright strip of plumage on the wings of birds. Such dualities allow for a kind of personal and cultural myth-making that feels at once a dissection of experience and something more acute, striking, and weirdly beautiful. The horrifying turn of the ‘Dead blue bird’ lingers on like a blot of blue ink, the unfinished mark of a sentence arrested mid-flight. Images of plague, toxicity, corruption and invasion abound in Milk Tooth; there is a sense of bodies being opened and penetrated, bodies being rent, bodies ‘cracked / and pushing’, bodies scraping ‘the walls’. What flourishes in Sprackland’s uncanny assemblage of pulsing things is a thriving ecosystem of grief. In her essay on miscarriage, ‘An Uncommon Language’, Sandeep Parmar writes, ‘A world gone quiet must be this fact. / For which there is no precise language’. Such declarative lines draw attention to this specific moment of poiesis, which draws from the aporetic ‘fact’ of experience, a black hole which resists definition and yet is teeming with resonance, memory, and repetition. This insecurity around articulation is perhaps rooted in trauma and medical amnesia, as much as a silenced literary history around pregnancy and women’s bodies. ‘How can I write about what I can’t remember?’, Sprackland’s speaker asks in ‘Lineage’, while in ‘Milk’ she relates being ‘bombed / with knockout drugs’. The end-stopped stillness evoked in Parmar’s lines can be found throughout Milk Tooth, yet in that Plathian control, that cool presentation of event, vibrant, clustering images take hold and push through intimacy and address: ‘Talk sweetly, old friend, surprise me’ (‘Gates’). I think of a line from Wallace Stevens’s ‘The Man with the Blue Guitar’: ‘Good air, good friend, what is there in life?’. This question of healthful air or song, of talking sweetly, suspending between clauses the motion towards contact, empathy — surely it stages an opening? Lying in bed, the speaker of ‘Tooth’ connects the entangled, surveilled intensities of worldly disasters to the clamours of pain in her own body. Such litanies of ‘a sealed world seething’ seem almost exhaustive, but the pacing of Sprackland’s lines implies a register of possible order, acknowledgement, and the healing intersections of empathy. This lyric gesture towards a chorus of farewells seems as much a bidding goodbye to innocence as to experience. There is a sense of reclaiming one’s life from the emotional currents of speech and story. Landing on the exclaimed bathos of ‘nothing’, we are reminded that matters of bodily loss are clotted with this question of nothingness, an absence marking various concavities. Despite this hollowing out, ‘grief is not pointless’; as Parmar reminds us, ‘its mourning or melancholy offers something when there is nothing to show’. Grief connects us to the world again, pulsing around and inside us, a physical language. Tentatively, stirringly, Milk Tooth moves towards a possible light, a mythic spirit, closing on the line: ‘all the forest’s doors are open’. You can find out more about Milk Tooth from Rough Trade.